Conflict in churches is a pervasive problem we know all too well. 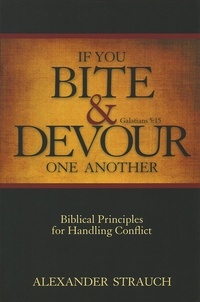 If You Bite & Devour One Another is the only book of its kind, examining all the biblical passages on conflict and outlining key scriptural principles for handling various kinds of conflicts among Christian—whether personal disputes, issues of Christian liberty in lifestyles, congregational matters, or disagreements about important doctrines. The book emphasizes Spirit-controlled attitudes and behaviors through solid Bible exposition and true-to-life stories of Christians handling real-life conflicts in a Christ-honoring way.